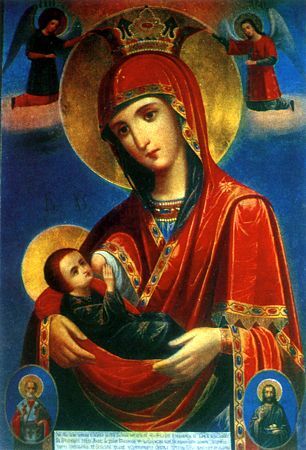 The "Mlekopitatel'nitsa" ("Milk-bearing") Icon of the mother of God was at first located at the Lavra of the Monk Sava the Sanctified near Jerusalem. The holy founder of the Lavra at his death foretold that a pilgrim Sava from Serbia would visit the Lavra, and gave orders to pass on to him as a blessing the wonderworking icon. This occurred in the XIII Century. Sainted Sava of Serbia took the icon to Khilendaria on Holy Mount Athos and put it on the right side of the iconostas in the church in front of the Kareia cells, afterwards named Typikarnitsa, since the Ustav of Sainted Sava was preserved there.